Wichita is jumping with quilters! Had a great time and learned lots! Always having fun here. Tomorrow is a class with Cathy Wiggins, looking forward to that too. 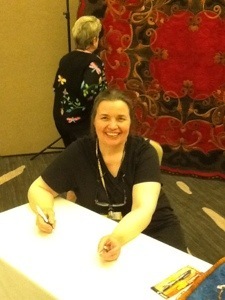 A guilt maker, longarm quilter and quilt designer. Mother of four children, Al, Mark, Stacey and Christopher, grandmother to Meagan and Madison, a set of twins RJ and Maria, and three step grandchildren, Allie, Jayne and Kevin. Proud mom to four beautiful boxers, Precious, Champ and Caitlin , Sasha, and non-boxer dog Charlie. 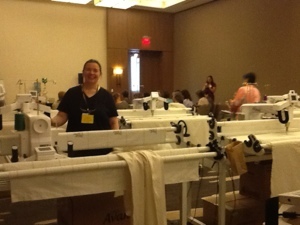 I would LOVE to learn to longarm!!! Maybe when I come to Houston for the IQS I can get into a class! Lots of longarmers in my guild, but no one seems willing to teach a newbie….If I learned how to use one, I could justify the purchase…..my darling husband keeps saying “write a business plan for that expensive machine” every time I talk about buying another machine!